View downslope toward the impact area (shown with red arrow) and damaged buildings. 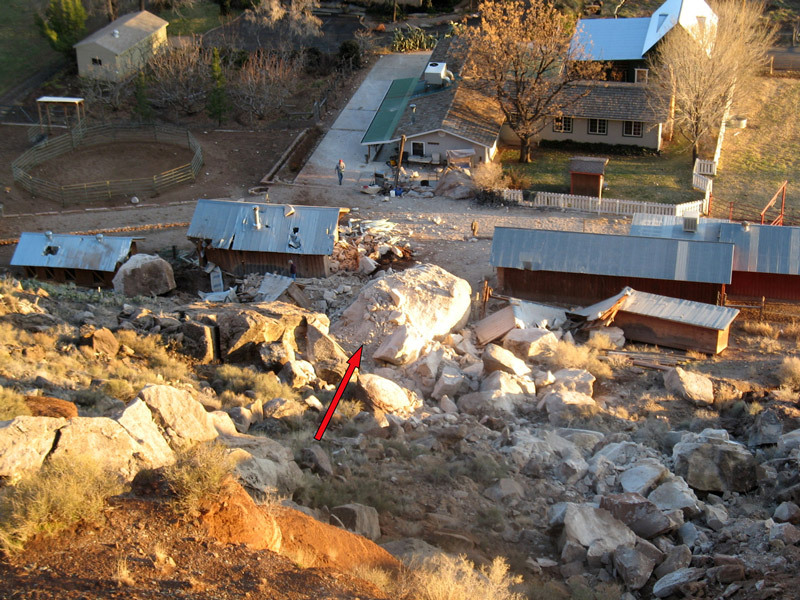 Had this large boulder not been present to break up the rock-fall boulder, this property and nearby properties may have incurred more severe damage. Rock fall in Rockville, Utah on February 10, 2010. 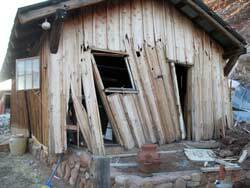 Around 7:40 a.m. on February 10, 2010, a large rock fall impacted a property at 274 Main Street in Rockville, Utah. The rock, estimated to be about 21 x 17 x 17 feet and weighing about 450 tons, slid and fell from the upper slope of Rockville Bench, began to roll downslope, collided with a large stationary boulder at the base of the slope, and shattered into numerous smaller fragments that damaged several outbuildings, two cars, and a house. 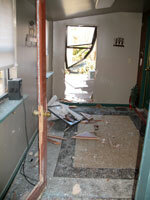 Although people were home at the time, no one was injured. 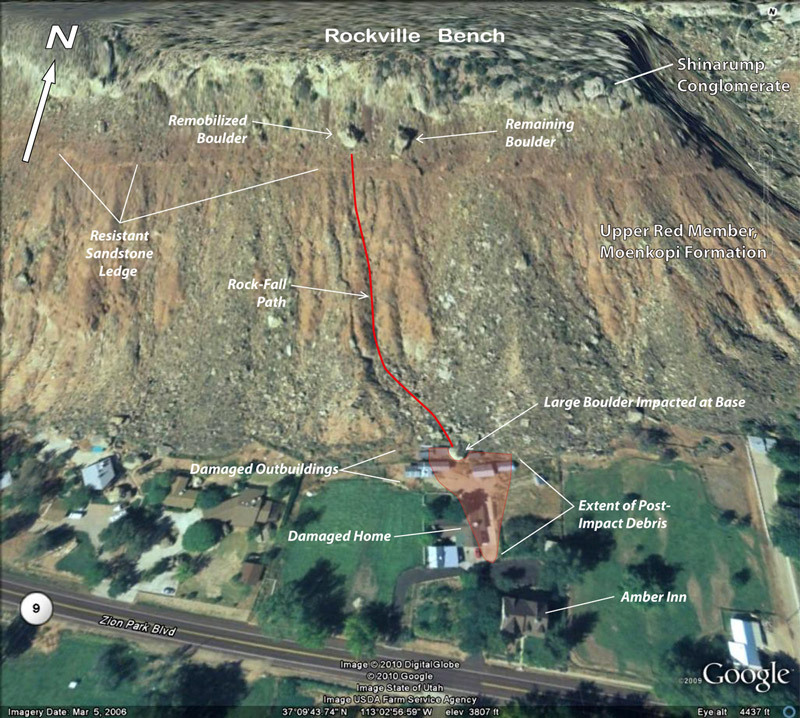 The rock fall occurred shortly after a protracted storm event on February 5-9, 2010 that produced 1.38 inches of rain at the Zion Canyon RAWS station, 4.5 miles northeast of Rockville. The rock fell/rolled 280 vertical feet and a slope distance of 500 feet before colliding with the other boulder. Debris ejected from the impact measured up to 9 feet in long dimension and traveled an additional 180 feet. The rock fall originated from the Shinarump Conglomerate Member of the Triassic Chinle Formation that caps Rockville Bench, although the event occurred in two stages. The rock originally detached from the Shinarump ledge, traveled about 40 feet, and came to rest on a steep slope formed on the upper red member of the Moenkopi Formation, where it remained high on the slope for at least 17 years. The rainstorm prior to the rock fall likely caused material beneath the rock to erode and caused the rock to slide, and then fall over a 12-foot ledge and roll down the remainder of the slope. 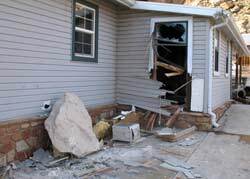 This rock fall occurred less than 2000 feet west of where another large rock fall severely damaged a home in Rockville in October 2001. A second large talus (rock already detached from its source area) boulder remains high on the slope and appears to be analogous to the boulder that moved. Numerous large boulders from prehistoric and historical rock falls are present along the base of Rockville Bench, indicating several homes there are in a high-rock-fall hazard area. 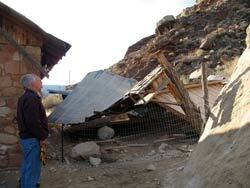 Although the occurrence of this rock fall does not necessarily indicate a heightened rock-fall hazard under present conditions, rock falls are possible in this area at any time and typically occur with no warning, often during and following storms, periods of freeze-thaw, and earthquakes.